Thai Cauliflower Rice Salad is packed full of flavor, spice, and made easy! 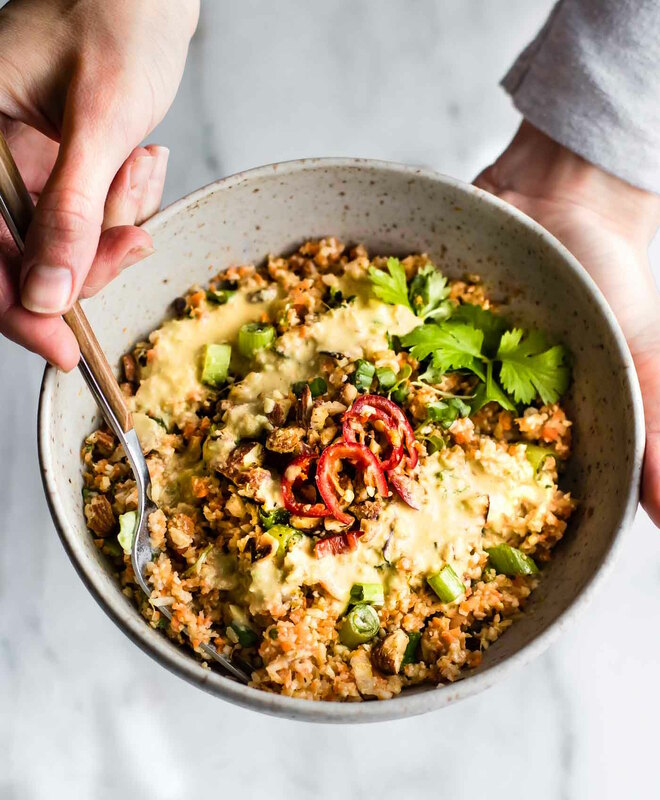 Thai spices mixed into a carrot cauliflower rice salad with avocado cream dressing! Paleo, Vegan, and made in under 30 minutes. Perfect as is or with a protein of choice. Simple, wholesome, healthy! Whole 30 friendly. 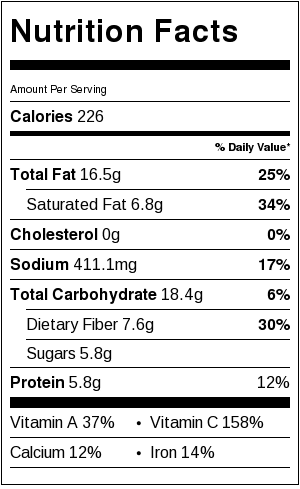 Say hello to my new favorite food in a bowl…. Thai Carrot Cauliflower Rice Salad with Avocado Cream Dressing. Ya, this warm salad is gonna keep me warm today. Oh, and Hi from Utah. Where it’s covered in SNOW and I survived my first *winter storm*. Yes, Utah, way different than Texas. I am currently trying to get a few house hold things situated before my husband arrives with ALL our stuff. Which means I am here without any kitchen supplies, table, couch, etc. Okay I lie. I did ship myself a few items. My Vitamix, food processor, and a pan. And the good thing is it only took me 8 hours to get the water on, heat, and bed. YAY! Oh Boy! It’s been… fun? Haha. We have so much newness going on here. Crazy good scary exciting newness. But I’m TOTALLY going to think of this as our life reset button. Perfect for January, don’t you think? So speaking of newness and reset. 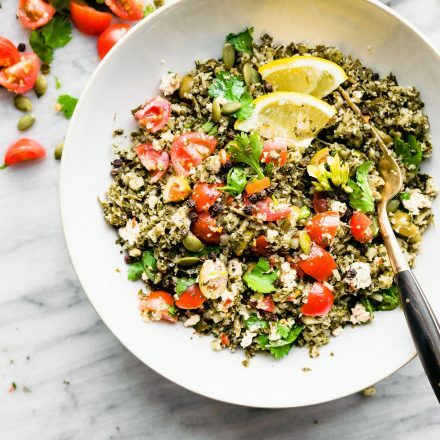 Um, this cauliflower rice salad is gonna RESET your whole concept of “cauliflower rice.” Ya, the trendy paleo vegan yada yada yada rice in veggie form. Either you love it or you hate it. And personally, I love cauliflower rice WHEN it’s used with the right combo or dish. Or for a good purpose. Like say, if you are insulin resistant or diabetic and your diet requires lower carb or sugar. Then this is one AMAZING lower carb dish that has the same comfort food taste and texture as a bowl of rice. Or if you simply want to branch out and try to new ways to eat more vegetables this year. Or if you are on an autoimmune protocol (to use food to heal) and certain grains cause inflammation or stress the body. 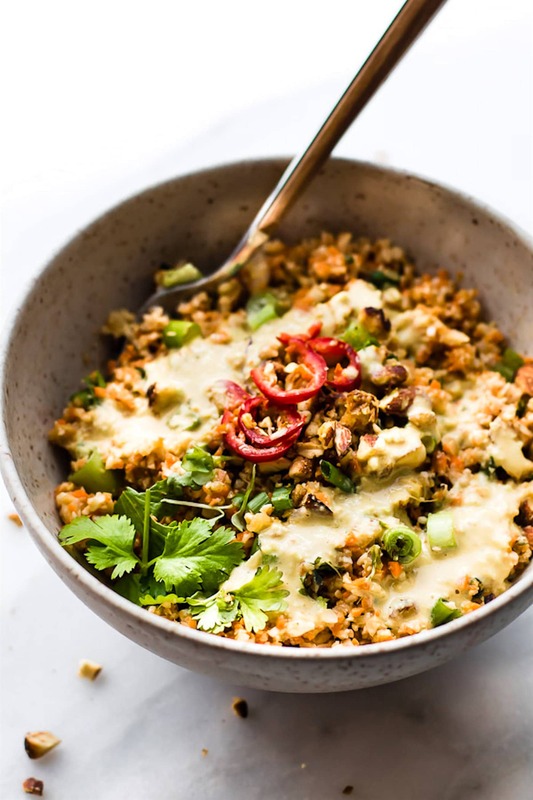 Well then YES, cauliflower rice errr… cauliflower rice salad is a great substitute and can even help fight inflammation. Cauliflower and Carrot and Avocado = SUPER FOOD trio loaded with Vitamin K, Vitamin C, other antioxidants, and omega-3 fatty acids. Those are LEGIT reasons to make this Thai inspired “Riced” Salad. That and because you just love me and my cooking, right? Hehe.. kidding. I had to throw that in there. But here’s the thing. The one thing I ask of you. Let’s not label this dish, this Thai Carrot Cauliflower Rice Salad with Avocado Cream Dressing, as diet food. Mmmm k? No, it’s PURPOSEFUL food. See, newness. New intentions. New focus. New Perspective. Food is fuel. Food is nourishment. Real Food is just plain AMAZING when you learn to prepare in EASY yet delicious ways. Let’s dive a little deeper here. Let me walk you through this simple and AFFORDABLE recipe. Just so you can see how easy it is to make this salad yourself. Really. It takes few ingredients, and few prep. Grab some carrots and cauliflower. Get ready to “rice” them. Pulse in food processor or blender. Set aside. Chop some almonds. Your thai peppers. And Garlic, onion, etc. Bam. DONE! Place in skillet. Add Coconut milk. Cook for 10 minutes. Done. Place in bowl. Add dressing and top with crush almonds, peppers, and cilantro. This warm thai salad is great just like this but the real SHOW STOPPER is that AVOCADO CREAM dressing. Ya’ll. The completion to the trio, remember? To make the avocado cream dressing, all you need is the perfect ripe avocado. Then just blend it with with coconut milk, oil, garlic, and thai flavors (I used chili pepper and lemon grass) . Drizzle dressing on top for the win! VOILA!! 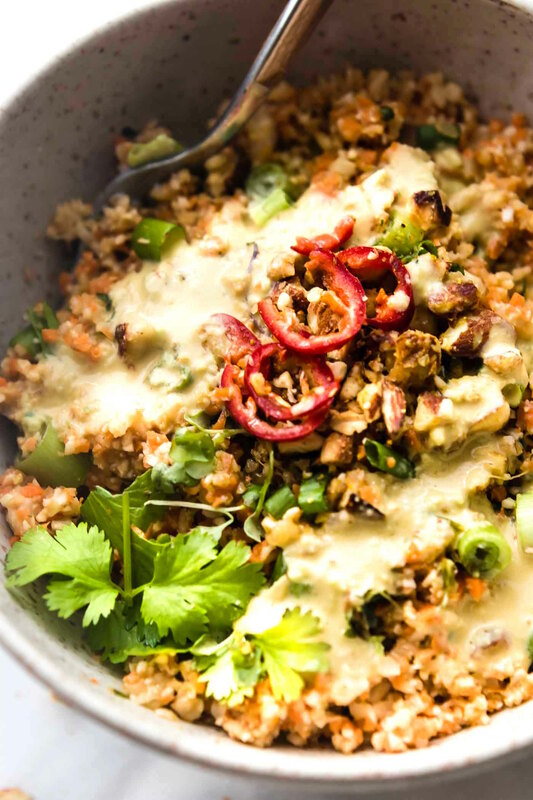 –> Your Vegan Paleo Low Carb flavor Jammed Thai Carrot Cauliflower Rice Salad is made. With SUPER DUPER creamy and healthy Avocado cream dressing. 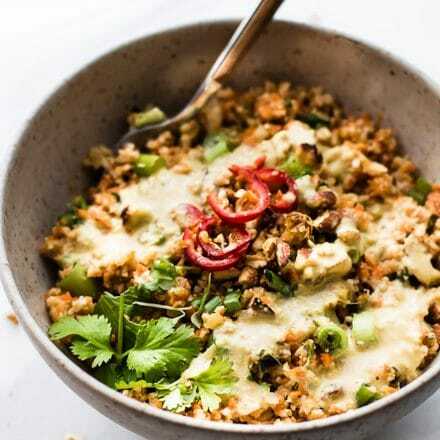 See the recipe for the cauliflower rice salad, below. Simply blend the lemongrass (minced), avocado, garlic, and, coconut milk. Once blended add in your spices tamari, chili sauce, and ginger. Depending on what chili sauce you use, your sauce will either be more green or more yellow/red in color. All taste great! You can thin out the avocado cream dressing by adding in 2-4 tbsp of water or coconut milk, and a little oil. Mix until texture is thinner. If you want it sweeter, add in 1 tbsp sweetener of choice such as honey, coconut sugar, or agave. Next, make your “rice”salad. Start by cutting the cauliflower/carrot into smaller pieces. Working in batches, place 1 cup of your veggies in food processor. Pulse until “riced”. Scrape sides between pulses if needed. Repeat until all the veggies are riced and placed in a large bowl. Next, chop the onion, green onion, and peppers. In a small pan, heat garlic, oil, and onion. Saute until fragrant. 1-2 minutes. Add in your carrot and cauliflower rice. Cook on medium for 2-3 minutes. Cook on medium, coating carrot cauliflower rice. Add a dash of salt/pepper and splash of lime juice. Mix again. Remove from heat. Place carrot cauliflower rice in large bowl. Mix in green onion, cilantro, almonds, red pepper (save a little of each for the garnish). Toss and garnish with the extra onion, cilantro, almonds, and red pepper. Drizzle avocado cream dressing on each bowl when serving. 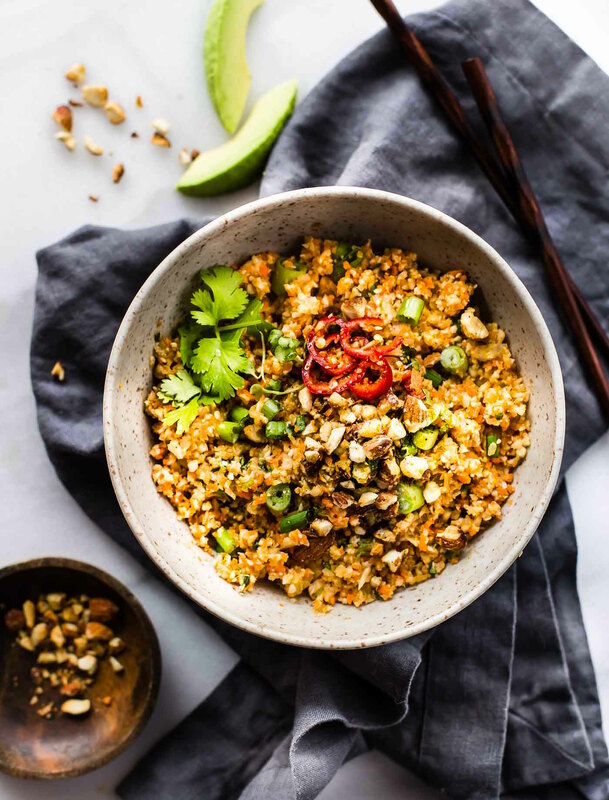 If this Thai cauliflower rice salad not a good enough reason to rejoice in newness, new things, new food combos, new salads, and new flavors, then I don’t know what else is. Okay I am exaggerating, but you get my point. Now excuse me while I go utilize the three cooking appliances I brought with me. It’s gonna be Thai Salad on repeat here for days! That or Fried Rice. Mmm… keep me warm and cozy. What one new dish you want to try in the New Year? 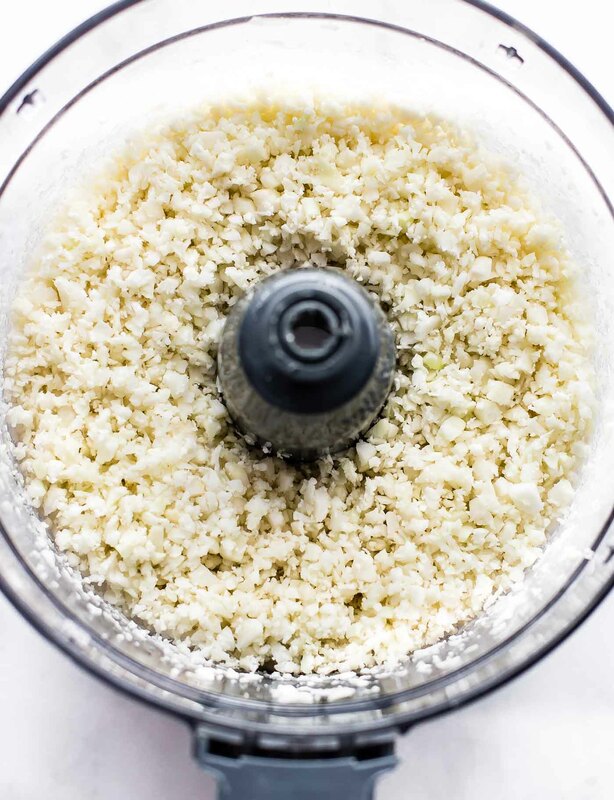 Cauliflower Rice fans, gimme your latest and greatest recipe to use it with! I always need more. p.s Um, I so had a picture of the avocado cream dressing texture and all … but… I packed the SanDisk somewhere in Texas and now can’t find it. Plus totally forgot to upload it before moving. Uh.. my brain. It’s lacking. Sorry folks. 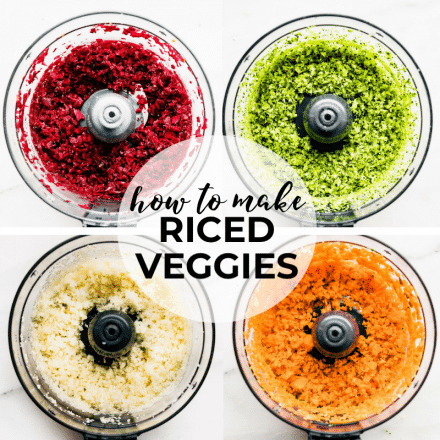 Do you “rice” veggies? Which recipes? Do tell! A Quick Thai Carrot Cauliflower Rice Salad with Avocado Cream Dressing! Easy #paleo #Vegan! Sounds like everything’s gonna workout for ya besides the cold . I have no words for that other than bundle up! And I have two words for ya -> butternut rice! haha yes to all!! and p.s yay for liking rice that is not rice. LOL! Anything with Thai flavor gets two thumbs up from me. I’d love this bowl for lunch today! yea! thanks friend. lunch coming your way! oh fun!! not sure I will be going but i will come into town to see you! I will always agree with you! What a creative and flavorful dish. I’m loving that avocado dressing – yum! My husband is on a cauliflower rice kick at the moment. This came at the perfect time. 🙂 Looks so good and that dressing sounds divine! This looks so full of interesting flavors and nutritious powerhouse foods! 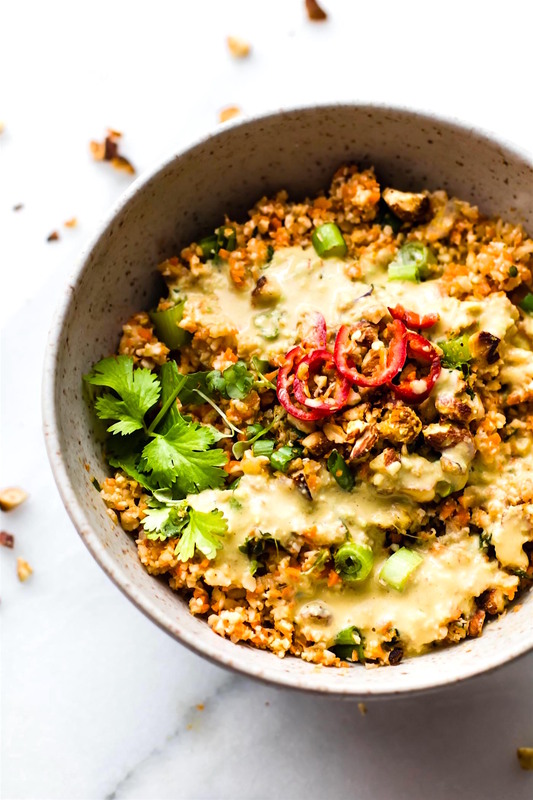 I’ve never tried making cauliflower rice but I think I’m going to have to give this a try. Looks amazing! I never thought I would like cauliflower rice but it’s really good in a bowl like this with so many other flavors going on. It’s the perfect blank slate. 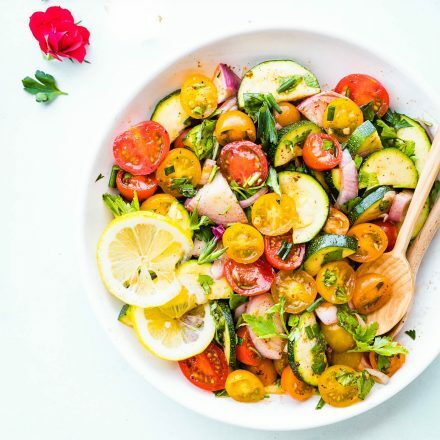 This dish is so colorful – there is nothing “diet” about it! I know cauliflower rice, crust, etc has gotten some negativity for being too trendy for too long, but I love it – I think it’s a great way to use up more veggies and wish I’d known how to use cauliflower this way back when I belonged to a CSA and was inundated with it! This recipe looks so yummy – I especially love the addition of the avocado cream dressing. I could not agree more Ali! As I said on IG – Toto we are not in Kansas anymore – 🙂 How are you handling it all? Wow. WOW. This looks incredible. 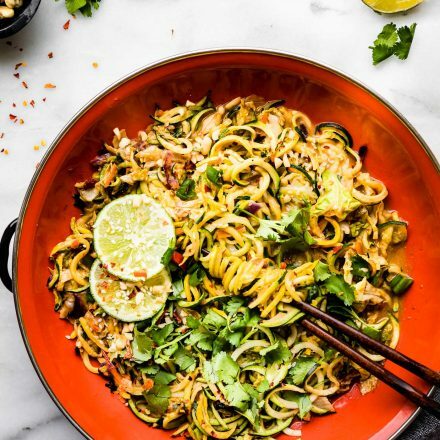 That avocado cream is so unique – so cool to add lemongrass!! My favorite way to use cauliflower rice is in your curried cauliflower soup. Ah this just looks fantastic! I have been sorta iffy on the cauliflower rice thing. I love cauliflower but I also love rice so I haven’t been sold on trying to make one the other, this however I am willing to give a shot! i feel ya! but i think you’d like this Hayley. It’s soooo flavorful! purposeful food, yay! hope you are doing well up there and not frozen solid! it’s funny, it’s the same degree (or warmer) than austin. Dry. Just we are up on mountain so there’s so much snow. Crazy, eh? avocado cream on ANYTHING is a win! This bowl looks dreamy! I just made cauliflower rice a week or so ago and I forgot how much I enjoy it. Adding to the menu for next week! These pictures are beautiful and this sounds amazing. I normally just make cauliflower rice with a little lime and pepper and top with black beans, avocado and corn. This takes it to a new level! Thanks Jess! Let me know if you give it a whirl. Once again a great recipe Lindsay 🙂 I am going to replace cauliflower with broccoli.. I love this recipe as you have dumped lots of healthy stuffs inside this. Sorry for the delayed response. I just loved it! I made with broccoli <3 My wife enjoyed each and every bite. A bowl of fried rice I can have for lunch, dinner, AND breakfast?! YES. TOTALLY trying this recipe out! yes, go for it cassie! This looks and sounds amazing!! I love one bowl meals where you can just mix everything together and enjoy all the flavors at once! I hope you are staying warm in Utah! Sounds like a big change from Texas! We used to live in the desert part of Utah and then moved to Montana where it was freezing and it was a huge shock! I hope you get settled in soon! Amazing recipe. I just love to eat carrot. The recipe is really delicious I cooked it. haha totally gotta do whatcha gotta do! Having an issue with Kaspersky antivirus visit our website. Please tell me you can freeze! Oh I am not sure. You could freeze it without the sauce then add the sauce before eating. Let me know if you try that! DO you use canned coconut milk? THank you for posting. Can’t wait to make this! You mean for the cream sauce? I use regular drinking coconut milk but have used canned too! either works, just depends on the taste you prefer. Ya know? Looking so delicious. Thanks for sharing with us.